Appartamento in palazzo d'epoca, in una strada tranquilla, con poco traffico, nel quartiere Trieste, un elegante e sicuro quartiere residenziale realizzato all'inizio del '900, ricco di servizi e di verde. Centro facilmente raggiungibile in autobus (fermata a 100 m). A pochi passi: mercato coperto, alimentari, negozi, caffè, pizzerie, ristoranti, supermercati, parco giochi per bambini (parco Nemorense), e uno dei grandi parchi romani (villa Ada). Raggiungibili a piedi con una breve passeggiata: quartiere Coppedè, catacombe di Priscilla sulla via Salaria e di Sant'Agnese sulla via Nomentana con il Mausoleo di Costanza. Bibliothècaire J'ai une fille de 18 ans et un fils de 16. J'habite dans le quartier Parioli, à 2 km de l'appartement en via Taro. Je suis hereuse de vous aider si vous désirez informations sur Rome et votre visite. Appartement bien situé, dans un quartier résidentiel agréable et assez calme. Très bon accueil de Madame FASELLA. Le quartier est désormais desservi par le métro B1 à la station Santa Agnese, à environ 10 petites minutes à pieds. Marché couvert, poste, supermarchés sur le trajet et parfaitement situés pour se ravitailler en rentrant le soir. Pour accéder à la Rome antique et aux vieux quartiers les plus prisés, il faut compter une bonne demie heure mais les rues sont si agréables en avril qu'aller chercher le bus ou le métro est un plaisir. A noter une excellente pizzeria, Via Chiana, "Mangia fuoco"...à 5 minutes de l'appartement. Délicieuse et peu chère (35 à 40 € pour un repas avec 2 adultes et 2 enfants, boissons comprises). Pourtant l'appartement présente des défauts assez embêtants à notre point de vue : - luminosité très faible et étant légèrement plus bas que la rue, les gens vous voient en permanence si les volets restent ouverts. - literie de mauvaise qualité dans la chambre parentale (attention le dos). Nous avons l'air pointilleux mais je tiens toutefois à réaffirmer que le quartier est vraiment top et que l'appartement reste correct. Je suis desolée pour le problème de fonctionnement du chauffage / chauffe eau. Je l'ai examiné tout de suite quand j'ai lit l'appreciation, et il marche très bien maintenant. Stayed for 5 months in this beautiful apartment. Really nice neighbourhood. The landlord is kind, reacts very quick and is always there if you need her. Felt like home! The apartment was great and 100% as advertised. Both Caterina and Francesco were very helpful and very accommodating. This was perfect for me, my wife and our 2 teenage daughters. Very safe area, we walked around freely at night without any worry. Very convenient to the sights (we had a car) and parking on the street was possible, if you don't mind driving around a bit to find a spot and walking a few blocks. Merci beaucoup, it was a pleasure to have you in our apartment!! I stayed in this apartment for over a month and found it was well-furnished with all the amenities needed for a long-term (or short-term) stay. 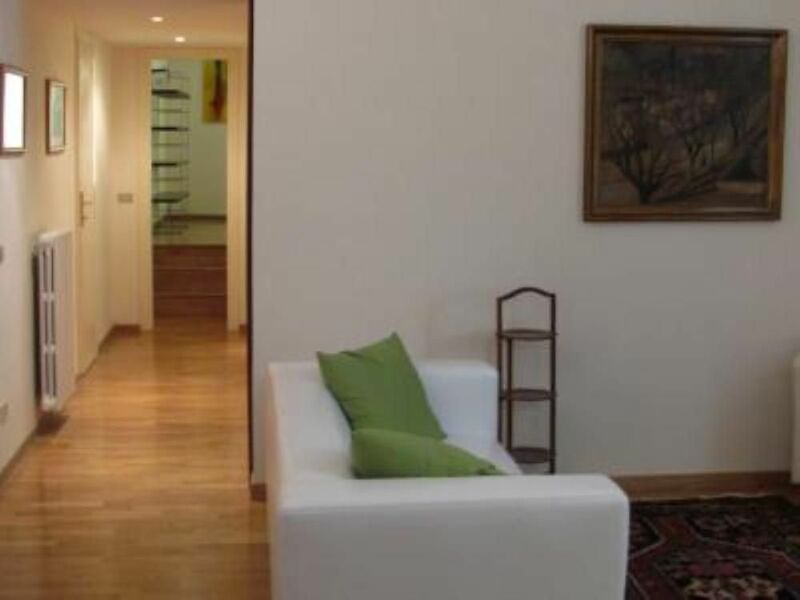 It was spacious and in a beautiful, quiet and safe residential area less than 30 minutes from the city center by bus. The location was ideal, as there are numerous convenient bus stops less than 5 minutes away as well as a metro stop less than 10. Within walking distance there are a number of supermarkets, restaurants, bars, shops, and parks. Despite being surrounded by so many things, the street of the apartment has very little noise or traffic. The owner was incredibly helpful and professional in arranging the arrival meeting, providing fresh towels and linens, and equipping the apartment with all the necessities (toilet paper, cookware, cutlery, computer) and extras (books, toys), and answering any questions that I had. She is a pleasure to interact with and incredibly accommodating. The apartment on floor 0 and is exactly as advertised in the online photos and description if not better. The price was more than reasonable for the size and location of the apartment. I would gladly recommend this place to anyone and would stay here again. Thank you very much, Cindy. I'm happy you enjoyed it and I will be really happy to have you again in my apartment. Grazie. Sono felice che la casa vi sia piaciuta. One can easily reach the center by bus (stop at 150 m). On foot, one can reach the center (via Veneto, the "Dolce vita" 25 minutes walk), the Catacombs of Priscilla on via Salaria (10 minutes walk); the Catacombs and the Basilica of Sant'Agnese and the Mausoleo of Santa Costanza, in via Nomentana (13 minutes walk); the Quartiere Coppedè (piazza Mincio, 5 minutes walk). Beautiful Roman parks are close by: Villa Ada (5 minutes walk), and Villa Borghese (15 minutes walk) with the Galleria Borghese (which I strongly reccomend: Caravaggio, Canova, Bernini, etc. ); Villa Torlonia in via Nomentana (13 minutes walk).